One month ago, I was brewing with ideas but lacked motivation as I juggled an increased workload, the house, volunteer responsibilities, outside chores, etc… The day before my last post, my mojo began cranking and I was ready to unleash my ‘special’ Christmas plans. Christmas Day was the one year anniversary of my step-dad’s fatal, construction accident. It was important that I make the day a happy, unemotional day for all. My side of the family is strongly dedicated to honoring long-time traditions. One of which is to celebrate Christmas at mom’s house with the same type of Christmas tree every year. After the opening of gifts we would always had a brunch with our traditional, doughy, Swedish Christmas bread called Jule Kage. Every year my mom would attempt to achieve an evenly, baked bread. Each year we would eat only the outsides of each loaf due to the center of raw dough. This year would be significantly different as we invited everyone to begin a new tradition of Christmas at our home. I was pumped as I was given the chance to bake the coveted Jule Kage and to have the freedom to try some new foods. 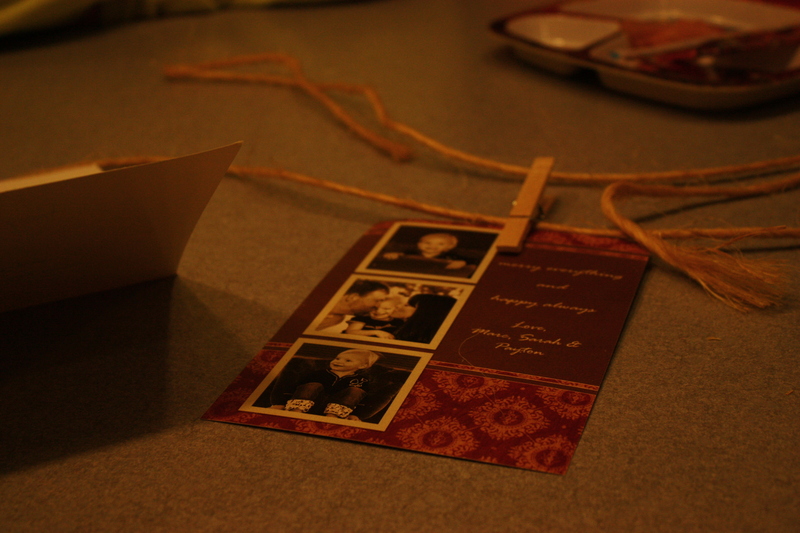 Using a clothes pin and twine we decorated the kitchen with Christmas cards. I also wanted to have the house nicely decorated but not overboard with respect to my mom. For a couple of years now I’ve been wanting to try a new way of displaying our Christmas cards. Using twine and clothes pins, we hung each card from the twine and draped the top of our kitchen walls with the twine. Not only did it bring the mood of Christmas into our home, it also became a game. Everyday I would get the mail, grab the cards and quickly hang them. In the evening, everyone would try to guess which cards were new and then we’d enjoy looking at the pictures of our friends. Everything was going smoothly as we approached Christmas day. Although I try to purchase gifts throughout the year, there were several I still needed to mark off my list. So one night after my hubby arrived home from work I took off on what turned out to be a very long night. My mom was doing the same but in different towns. We would call each other, looking for ideas, checking for duplication, comparing prices, etc… At the first phone call I noticed a bit of a tickle in my throat. As the phone calls went back and forth the tickle grew to a cough. I went to bed very late that night and took a nap the next day. When I awoke my voice was gone but in it’s place was a horrible sore throat. During the next 24 hrs. my cold symptoms continued to increase. Then the fever started. I patiently waited for my hubby to arrive home with cold medicine since I had run out earlier in the day. Before I knew what was happening or what to do I was running a fever of 104.8. I was calling him for help but he couldn’t understand what I was trying to tell him. I tried calling my doctor but called the pediatrician’s number. Thankfully, the nurse helped me. From the symptoms he felt it was probably influenza and suggested I get the fever down immediately or go directly to the ER. Had I known how dangerous it is for an adult to run a fever that high, I would have found someone to take the kids and take me to the ER. Instead I waited for the cold meds. It took a couple of hours and standing outside but eventually we got it below 104. By the next day it was safely running around 102. 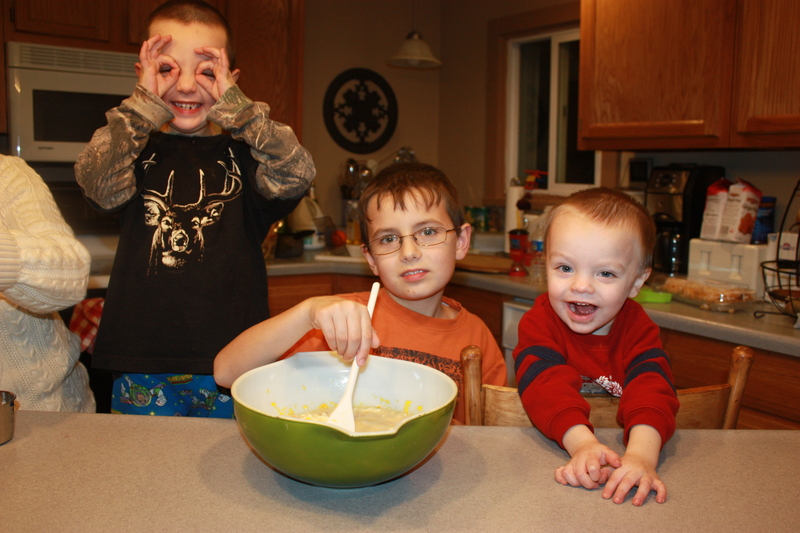 The boys making Christmas bread...a.k.a. Jule Kage. kids helped her make it. I continue to be tired and still have a cough that just won’t go away. Everyday it seems to be better. Luckily, Pudder was the only one who ended up with the flu and it was a smaller version. All three kids did get their flu vaccines. I still have big plans for my new blog…I’ve just been set back a bit. I also hope to be back working on Monday morning. Lesson learned…I do not plan on skipping out on the flu shot again. This entry was posted on January 1, 2011 by themagicfarmhouse. It was filed under Uncategorized .